Whether you’re looking to remove popcorn ceilings in Raleigh, Cary, Durham and beyond, or have them installed in your home, Osborne Painting can handle all your needs. The main goal at Osborne Painting is to provide our customers with the best quality workmanship at the fairest of prices possible. We give you the peace of mind that the work will be done in its entirety and as discussed — no questions asked! In addition, we welcome our customers asking questions and making comments about our exterior painting and interior painting jobs. It is your home, after all! 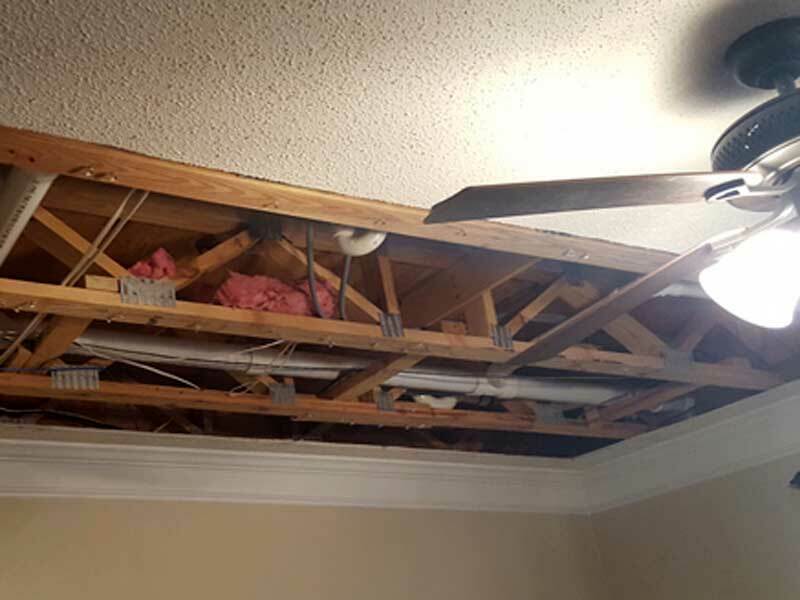 Our home interior service providers are at hand and ready to deal with the popcorn ceilings present in your Raleigh home today. Safety – Was your home built before 1984? Did it have popcorn ceilings installed during that decade? If so, there is a chance that your popcorn ceiling material contains asbestos. Originally used for its fire resistance, asbestos, if in your home, can become airborne and breathable if scraped from the walls. Not only can it be harmful to the person removing the popcorn ceilings, it can also be detrimental for those living in the house. Osborne Painting can test for asbestos, and if it’s detected, we can advise you on your options. An Increase in Home Value – Popcorn ceilings aren’t as popular as they once were; nowadays home buyers in Raleigh-Durham tend to gravitate towards homes with smooth ceilings. In many cases, removing popcorn ceilings will boost buyer interest in your home if you’re in the market to sell. Modernity In Your House – Some people in the Raleigh area still enjoy popcorn ceilings — they are a great acoustical solution for homeowners. Despite their remaining popularity, most consider them to be a bit dated. Removing them and exposing the previously-covered flat, smooth ceiling can be a stylish upgrade. After removal of the popcorn, intensive preparation work is done to ready the ceiling to best receive the paint. Our interior painters can then come in and paint your newly-smooth ceiling. That said, be sure to check out our blog article covering how to choose interior paint for your Raleigh home, as many customers request that their homes’ walls and ceiling match. Osborne Painting serves homeowners in Raleigh, Cary, Durham, Chapel Hill, Wake Forest, Rolesville, North Raleigh, Falls Lake, Creedmoor, North Hills, Knightdale, Brier Creek, Apex and more. Reach out to us today for a custom quote!